The publication of the annual Digital News Report, from the Reuters Institute for the Study of Journalism at Oxford University, is eagerly awaited by news execs around the world. So much so, that the 2017 study is being accompanied by major presentations on June 22 at the GEN Summit in Vienna, and at the Tow Center for Digital Journalism at Columbia University in New York. Clocking in at 133 pages, this sixth annual study, has been expanded to cover 36 different markets around the world (the first, in 2012 examined just five countries), shedding light on many countries – including nations featured for the first time such as Mexico, Malaysia, Croatia and Romania – which are seldom reported in English-language media. Against this backdrop it’s fascinating to determine some of the similarities – and differences – between digital news habits in the U.S. and the rest of the world. With that question in mind, here are seven important developments worth highlighting. 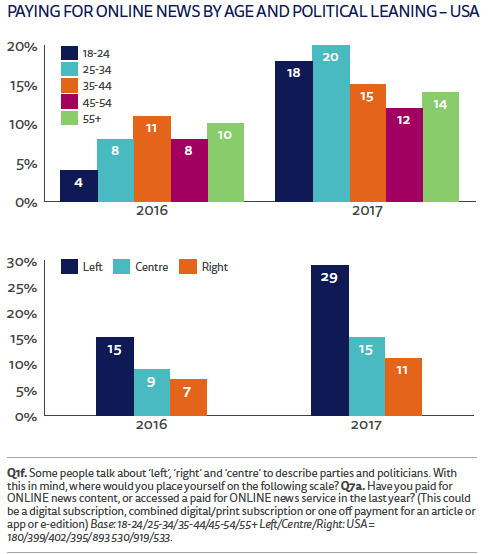 Interestingly, although this growth is across all demographics – and all political persuasions – this increase is much starker among younger news users and those identify themselves as being on the left of the political spectrum. Of U.S. consumers who had paid for online news in the past year, nearly a third (29%) declared their primary motivation as being “I want to help fund journalism.” This contrasted with 13% of paying news users around the world. 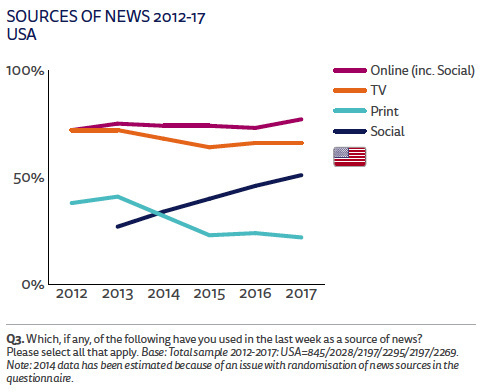 As the report notes, “it is too early to know whether these increases constitute a groundswell, or simply a knee-jerk reaction to a political shock.” With 62% of non-paying digital news consumers in the US describing themselves as “very unlikely” to pay for news in the future, this spike in subscriptions and donations may well level-off next year. 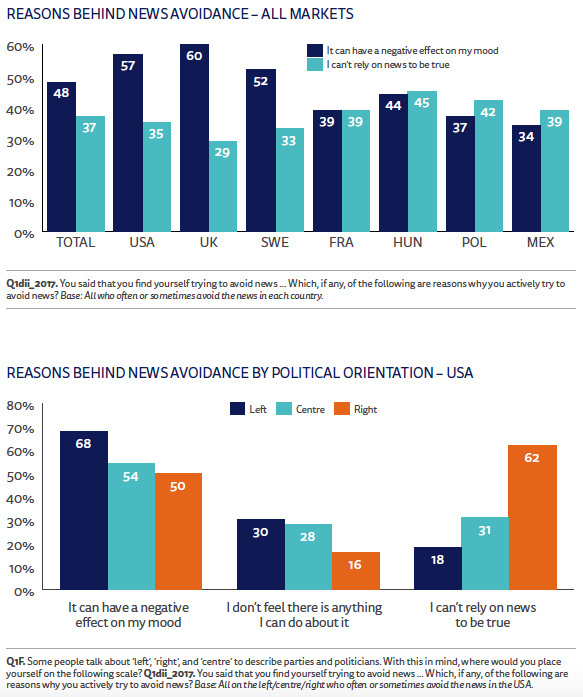 “In most countries, we find a strong connection between distrust in the media and perceived political bias. This is particularly true in countries with high levels of political polarization like the United States, Italy, and Hungary,” the study states. Americans who identify themselves on the “right” are much less likely to trust the news (20% versus 51% on the left). The reverse is true in the UK. Overall, although trust is up +5% from last year, only 38% of all digital news users in the US say they trust the media. On this index, that means US ranks 28/36 in the study for trust in the news. In a number of politically charged environments around the world, it appears that some audiences are deliberately trying to avoid the news. Avoidance, almost half of Reuters’ sample (48%) said, was typically driven by a sense that “it [the news] can have a negative effect on my mood,” rather than due issues of trust (37%). Nonetheless, there were substantial national variances. In the U.S., political positioning, again, plays a prominent role. Drivers for news avoidance – depending on whether you define your political views as left or right – can be quite different. 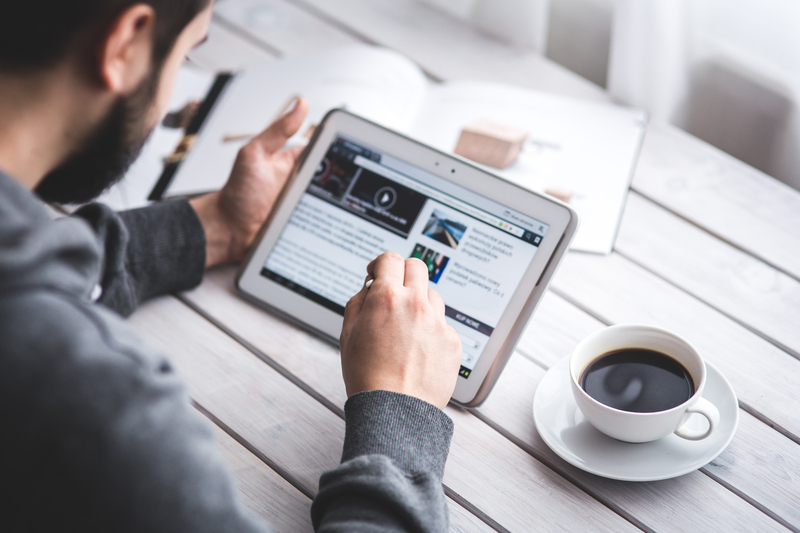 Moving away from politics, our ability to consume – and discover – news content from a myriad of different sources is clearly shown in the new report. Our media consumption increasingly includes a wide variety of different products and services. This includes delivery platforms old and new; with many older platforms continuing to grow as they are reinvigorated for the digital age. On a weekly basis, nearly a quarter (23%) of U.S. news consumers get news from email; the third largest market for this behind Belgium (34%) and Portugal (30%). Meanwhile, against the odds, it appears that usage of news apps is – once again – on the increase. “This is much more likely to be about more regular usage by existing app users, rather than by some surge in new installs,” the report authors speculate. 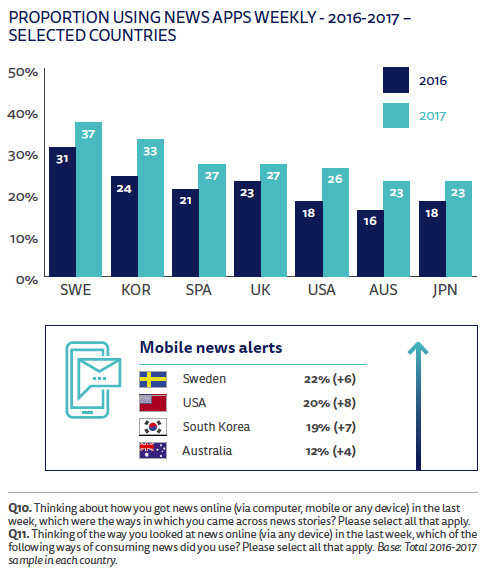 Mobile alerts – news notifications which pop-up on the locked screen – are used by 1 in 5 (20%) of US digital news consumers. This habit is most popular in Taiwan (32%), Hong Kong (27%) and Turkey (24%). Many newer delivery formats are pioneered in the U.S.
Snapchat Discover: – which launched in January 2015 – has a reach of 23% with 18-24s in the US and 10% in the UK. The first non-English language version of the service launched in France last September. It already enjoys a 9% reach amongst 18-24s. Apple News app: Available only in the US, UK and Australia – it is now used by 25% of iPhone users in the US, up from 13% a year ago. Growth in Australia has been even more dramatic, up +17% in the past year, to also reach 25% of iPhone users. 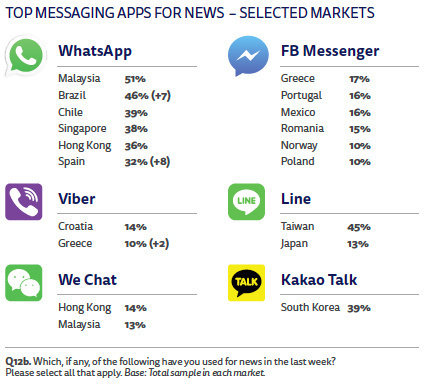 One area where the US is perhaps notably absent, however, is in the role of messaging apps as a means for sharing or discussing the news. In this regard, South East often dominates, both in terms of innovation and mass-market adoption for news purposes. Services like Amazon Echo and Google Home are pretty nascent technologies, and only available in a few key markets. But, Reuters’ research suggests this platform already has a news reach which seems to exceed the smartwatch. Voice controlled digital assistants are already being used for breaking news by CNN, and other publishers such as the Wall Street Journal and the BBC World Service, as well as German media organizations Spiegel and Bild. Whether they’ll continue to grow – and potentially go mainstream – remains to be seen.